Open Hosting app and extend your account for 6 or 12 months. Register a new domain name free of charge. Wait until your order is processed and the domain name registration is completed. Open the Hosting app, proceed to "Domain" section, and click on "Register new domain name". Enter desired domain name and pay for its registration. Wait until your order is processed and the domain name registration is completed. 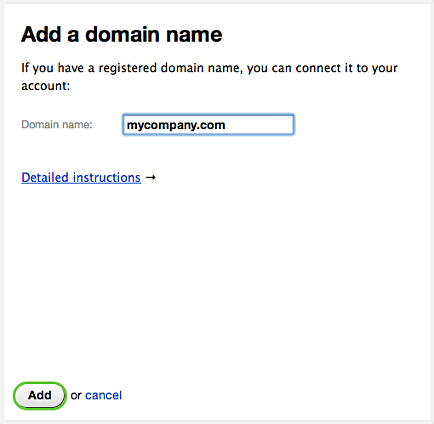 Open Site app and change service domain ***.webasyst.cloud to your registered domain name in Settings screen. Open Hosting app, proceed to Domain section, and click on "Link my existing custom domain name". Enter your domain name in the pop-up area shown below and click on confirmation button. 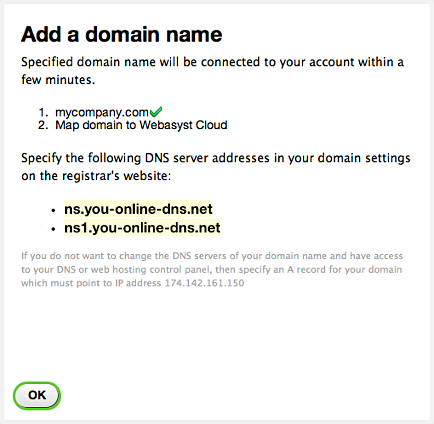 Copy the Webasyst Cloud DNS server addresses from the pop-up area and save them in your domain name's settings on the registrar's website.